A measure of U.S. for-hire freight movements set another record high in February, according to new Transportation Department figures released Wednesday, following no change the month before. 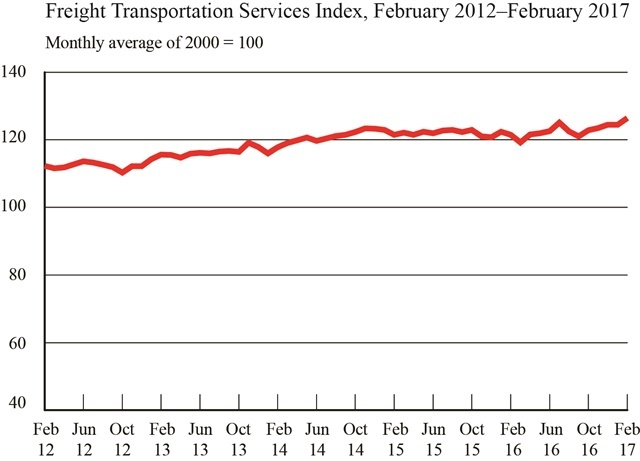 The 1.5% increase in the Freight Transportation Services Index (TSI), places the gauge at a level of 126.4 for the month, 33.5% above the April 2009 low during the most recent recession. The latest all time high exceeds the previous one hit in July 2016, by 1%. The December and January indexes were both revised to 124.5 from 123.2 in last month’s release. When February is compared to the same time a year ago the latest increase totals 4%. The Freight TSI measures the month-to-month changes in for-hire freight shipments by mode of transportation in tons and ton-miles, which are combined into one index. The index measures the output of the for-hire freight transportation industry and consists of data from for-hire trucking, rail, inland waterways, pipelines and air freight. The February increase in the Freight TSI was broad based, with growth in all freight transportation modes except pipeline. The increase took place against a background of upward signals in other economic indicators. Employment, housing starts and personal income all grew in February. Also, the Institute for Supply Management’s Purchasing Managers’ Index, which measures manufacturing output, showed positive and accelerating growth. And while The Federal Reserve’s Industrial Production index was unchanged, growth in manufacturing and mining offset by decline in utility output. The February TSI increase represented the fifth month in a row when the measure moved higher or was stable, for an overall increase of 4.5%, following two months of declines. For the year to date, for-hire freight shipments measured by the index were up 1.5% in February compared to the end of 2016. According to the department, research has shown a clear relationship between economic cycles and the Freight TSI.